Sound too good to be true? Sadly, there are a lot of people out there who don’t realise that these propositions are often exactly that. But it’s not that they’re stupid, or greedy – the people behind these scams are very charming and very plausible, and know all the right buttons to press to entice honest but inexperienced people into the snake pit. In Snake Oil! Kay McMahon and Theodore Koukouvitis take a critical look at the MMO industry, the people who dominate it, and their products. Both authors call on years of experience in making a living online to examine the claims made for MMO products, the way they’re presented to the inexperienced customer, and the substance of the products themselves. They explain why the products sell so successfully, why they don’t deliver on the claims made for them – and why, in spite of this, their devotees keep coming back for more. This book clearly identifies the techniques used to put together and sell these MMO ‘frauducts’. 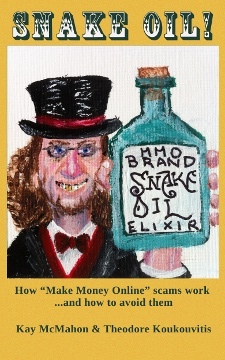 For those setting out to make money online, it offers a powerful antidote to the charms of the snake oil sellers. You can buy this book through any local version of the Kindle Store. For your convenience, we’ve provided links to all of them. I bought this book and its quite an eye opener. I had no idea that there were so many scams going on. A lot of it seems quite plausible. It’s rare to find a book like this because it’s buried among hundreds of other books telling people how to get rich quick. I would like to ask if I may have you sold a lot of these? No, I haven’t sold a lot. Sales are still in double figures. As you say, the book is on sale alongside hundreds of get rich quick books. It’s not just a case of it not being noticed with all the competition, it’s also that people don’t seem to want to read stuff to help them avoid getting ripped off. They’d much rather buy and read fairy tales which tell them how easy it is to make money online and how they could be earning six or seven figure sums very easily if they buy a recipe containing a few secrets. None of these ‘secrets’ ever work of course. And if they did they wouldn’t be a secret for very long, given that there’s a book on sale telling the world about it. Apart from finding the Snake Oil book an eye opener, did you find any of it useful? Did you learn anything?